Today’s hyper-competitive landscape means that standing out from the crowd isn’t just good strategy: it’s essential for survival. That’s where vehicle wraps enter the picture and make a transformative difference to your branding, visibility, and bottom-line. The vast majority of businesses — and virtually all small firms — cannot justify spending tens or hundreds of thousands of dollars on TV, broadcast, and other conventional outreach campaigns. Fortunately, these high costs are not a barrier with vehicle signage. For example, putting up a static billboard in the GTA can cost well over $10,000 per month (depending on the location). For that same amount, a business could wrap a fleet of cars, vans, or trucks and transform them into mobile billboards! What’s more, vehicle wraps are a one-time fee that will last for years. Aside from the cost and the fact that calculating ROI is fuzzy at best, one of the biggest drawbacks of conventional advertising (i.e. billboards, radio, TV, etc. ), is that businesses may not be — and often aren’t — effectively reaching their target audience. For example, some readers may remember the famous Inglis appliance billboard on the Gardiner Expressway that offered drivers a daily dose of wisdom (“A rolling stone gathers no moss” and “Live while you are alive,” etc.). While the idea was nice, there was a big problem: people driving on the Gardiner weren’t thinking about buying a washing machine, dryer, or other appliance. They were angrily thinking about why the Gardiner is always under construction! And so, when the contract came up for renewal in 2014, Inglis pulled the plug (pun intended) on the billboard ad. They simply weren’t reaching their target audience in the right way at the right time. 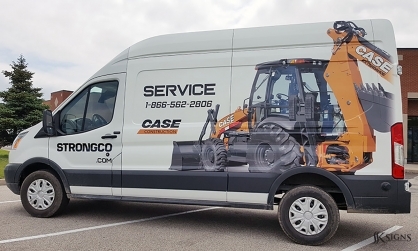 Compare this with vehicle wraps, which by definition are mobile — and as such, businesses can go to wherever their target market is located. For example, companies that sell home appliances could head out to new developments in cities like Milton, where home buyers moving into new developments are searching for appliances. Or they could head to older neighbourhoods in cities like Mississauga and Brampton, and reach families when they’re able to focus on home improvement possibilities and might be interested in purchasing new products. Simply put, vehicle wraps get the job done. According to research by the Outdoor Advertising Association of America, 98% of in-car audiences said that they notice vehicle signage, and 29% said they make buying decisions based on that signage. To get professionally designed and installed vehicle wraps that are affordable, allow your advertising to be mobile, and help your business boost visibility, branding, and the bottom-line, contact the team at SSK Signs today by calling 905.282.2225 or emailing [email protected] Our experience is your advantage!